The days are long, but the years are short. That is what they told me. And the days ARE long. 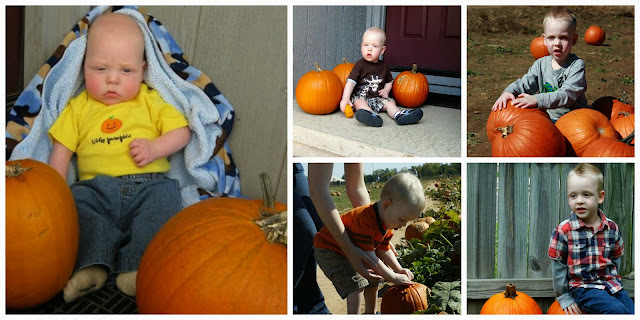 But how is it possible that this is Bubby's FIFTH year to get pumpkins? So clearly they were right. The years are short. Each year I say, "These are my favorite ages." Then the next year comes, and I love those ages just as much. And as much as I love that my children sleep through the night and one of them is potty-trained and semi-independent, there is a part of me that misses the sweetness that comes with babyhood. I love these two so incredibly much. Words will never describe my love for them. Excuse me while I go cry a little bit .Tomorrow I'll post some fall pictures I took of the boys with my semi-broken camera.